Cedars, including both the eastern red cedar (Juniperus virginiana) and the white cedar (Thuja occidentalis), can be planted into dense evergreen hedges to create a privacy screen, windbreaker, songbird habitat or aesthetic boundary to visually set off a planting area. Prune your cedar hedge to keep it in a tidy shape, minimize winter snow and wind damage, and encourage lush, uniform green growth. Remove any small branches on which the leaves have "flagged" or turned brown by cutting the base of that branch flush with the branch from which it grows, using bypass hand pruners. Spray the pruners with rubbing alcohol after each cut to avoid transferring any fungi or diseases to other branches or plants. Inspect the hedge to locate any larger broken or dead branches. Sever these branches by reaching into the interior of the cedar hedge with long-handled anvil lopping pruners. Cut each dead or broken branch to its base, flush with the branch from which it grows. After cutting, hold onto the base of the branch using the long-handled anvil loppers as tongs and gently pull the cut branch out through the foliage, avoiding doing damage to the remainder of the shrub. Spray the loppers with rubbing alcohol after cutting. Head the cedar hedge by trimming across its top, parallel to the ground, with hedge shears. If the hedge is taller than shoulder height, stand on a stepladder to ensure that you head the hedge parallel to the ground, rather than reaching up with the hedge shears at an angle. Trim the sides of the cedar hedge with hedge shears. Hold the shears at an angle to prune the cedar hedge sides at a slight slope outward from the flat head or top of the hedge to the ground, so that the bottom of the hedge is slightly wider than the top of the hedge; according to the University of Kansas Cooperative Extension System, this pyramidal shape is necessary to ensure that lower branches get adequate sunlight and ventilation to maintain the dense growth down to the ground as long as possible. Spray the hedge shears with rubbing alcohol periodically as you proceed to trim the length of the hedge. Prune back any long, rogue new branches which may sprout from the cedar hedge throughout the growing season but trimming them back to the branch from which they emerge with bypass hand pruners. Don't shear your cedar hedge back beyond the level of the outer green growth, as the remaining branch stumps will not sprout new leaves. Eastern red cedar (Juniperus virginiana) is a host to cedar apple rust, which can damage nearby apple and crabapple trees. 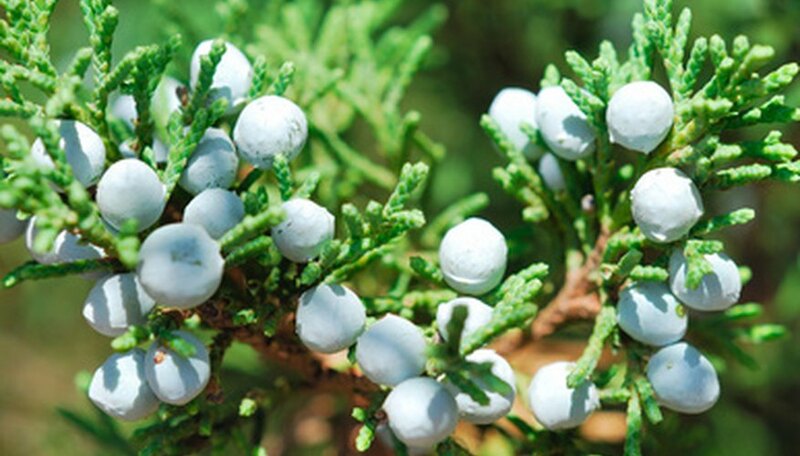 Carefully inspect your cedar hedge as you are pruning it, and remove any infested plants. British Columbia Ministry of Agriculture and Lands: Dying Cedar Hedges-What is the Cause?